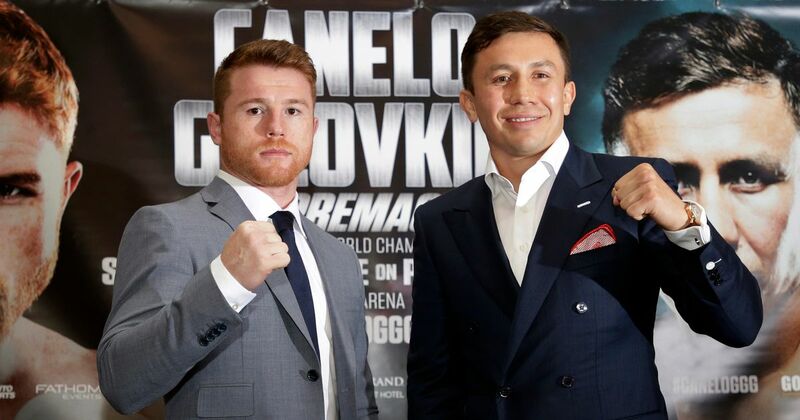 Lineal and Ring Magazine Middleweight Champion Canelo Alvarez (49-1-1, 34 KOs) and WBC/WBA/IBF/IBO Middleweight Champion Gennady “GGG” Golovkin (37-0, 33 KOs) hosted the final press conference ahead of their showdown on Saturday, Sept. 16 presented live on HBO Pay-Per-View® at T-Mobile Arena in Las Vegas beginning at 8:00 p.m. ET/5:00 p.m. PT. The live stream of the press conference can be viewed here. “Congratulations to Tom and Oscar for putting this together. This is truly a momentous event this Saturday. This is the best fight that can be made in boxing. This is potentially fight we think about in years to come. The first fight will be at 5:00 p.m. PT/ 8:00 p.m. ET. Also, fighters from the Canelo vs. Golovkin undercard hosted a media workout at MGM Resort Hotel and Casino before their upcoming fights this Saturday, Sept. 16 at T-Mobile Arena. In the co-main event of the Canelo vs. Golovkin undercard, Joseph “JoJo” Diaz, Jr. (24-0, 13 KOs) and Rafael “Big Bang” Rivera (25-0-2, 16 KOs) will face off in a 12-round WBC Featherweight title eliminator. Randy “El Matador” Caballero (24-0, 14 KOs) and Diego De La Hoya (19-0, 9 KOs) will face off in a 10-round super bantamweight battle for the Caballero’s NABF Super Bantamweight title and the vacant NABO Super Bantamweight title. Ryan “Blue Chip” Martin (19-0, 11 KOs) and Francisco Rojo (20-2, 13 KOs) will battle it out for Ryan’s WBC Continental Americas and the vacant WBA Intercontinental lightweight titles in the opening bout of the HBO Pay-Per-View®telecast. Canelo vs. Golovkin is a 12-round fight for the middleweight championship of the world presented by Golden Boy Promotions and GGG Promotions and sponsored by Tecate, BORN BOLD; Hennessy, Never Stop, Never Settle; O’Reilly Auto Parts. Better Parts, Better Prices…everyday! ; Fred Loya Insurance; Interjet; Thor: Ragnarok; Fathom Events; Tsesnabank; and Capital Holdings. Diaz, Jr. vs. Rivera is 12-round WBC Featherweight Title Eliminator bout presented by Golden Boy Promotions. Caballero vs. De La Hoya is a 10-round fight for the NABF and vacant NABO Super Bantamweight Championship presented by Golden Boy Promotions. Martin vs. Rojo is a 10-round lightweight fight for the WBC Continental Americas and vacant WBA Intercontinental Championships presented by Golden Boy Promotions and GGG Promotions in association with Cancun Boxing. The event will take place Saturday, Sept. 16 at T-Mobile Arena and will be produced and distributed live by HBO Pay-Per-View® beginning at a special time of 8:00 p.m. ET/5:00 p.m. PT. For more information, visit www.goldenboypromotions.com and www.hbo.com/boxing; follow on Twitter @GoldenBoyBoxing, @canelo, @gggboxing, @OscarDeLaHoya, @hboboxing, @TomLoeffler1, @JosephDiazJr, @RandyELMatador and @DiegoDeLaHoya; become a fan on Facebook at www.Facebook.com/GoldenBoyBoxing, https://www.Facebook.com/gggboxing/ and www.Facebook.com/HBOboxing; follow on Instagram @GoldenBoyBoxing, @canelo, @gggboxing, @HBOboxing, @OscarDeLaHoya, @josephdiazjr, @randyelmatador, and @diegodelahoya94; and follow the conversation using #CaneloGGG.